Inspired by the Black Power movement in the U.S., the Nigerian playwright, Obi Egbuna, founded the British Black Panthers (BBP) in 1968 in London’s Notting Hill. 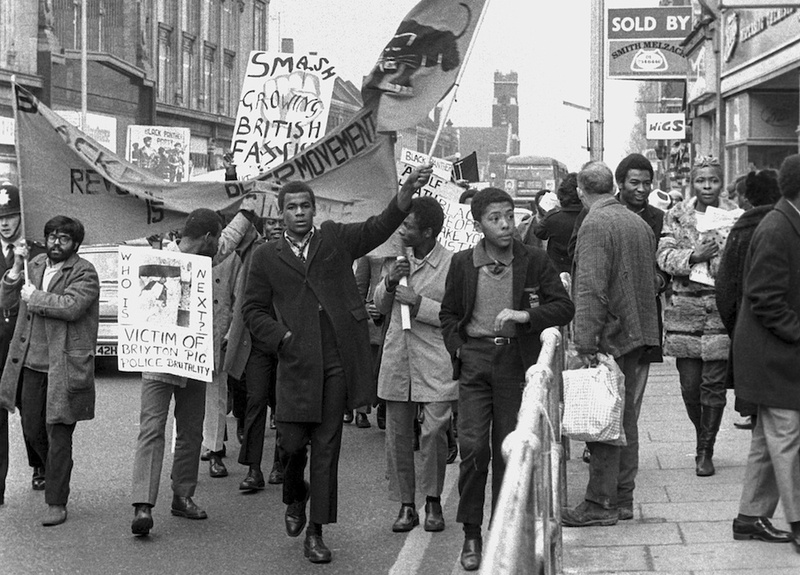 In Britain, people of Caribbean, African, or South Asian descent, who were mainly immigrants from former British colonies, were considered to be “black.” The tripling of Britain’s black population from 300,000 to 1 million from 1961 to 1964 led to increased racial and class tensions, especially in London’s Afro-Caribbean community. These tensions led to more police repression and the creation of the BBP. While the BBP was not an official chapter of the Black Panthers, it was the first Panther organization outside the United States, adopting the Panther’s symbols of military jackets, berets, and raised fists. Under Egbuna, BBP fought against police brutality. London police attempted to destroy the new party by arresting Ebguna and two other Panthers on bogus charges of threatening police. Ebguna was found guilty, and while he was in prison, Althea Jones, a Trinidad-born Ph.D. student at the University of London, became the leader of BBP by 1970. Althea Jones along with her partner and later husband, Eddie Lecointe, South Asian Farrukh Dhondy, and Neil Kenlock changed the focus of BBP. The Party began grass-roots organizing of local black communities in England around each community’s issues of racial discrimination in jobs, housing, education, and medical and legal services. The BBP moved their headquarters to Brixton, a poorer black community in London. Under Jones’s leadership the Panthers became a highly effective community organization that also collaborated on white working class issues and fought British imperialism. Like the Black Panther Party in the U.S., they stressed working-class solidarity in addition to fighting racial discrimination and oppression. As part of their community work the BBP engaged in legal advocacy for blacks in 10 British cities as well as in London. The high point of their advocacy work was their defense of the Mangrove restaurant that was the central meeting place for Notting Hill’s Caribbean community. The police regularly harassed and raided the Mangrove without ever finding any drugs. The BBP helped organize a demonstration against the police that led to the arrest and charging of nine black leaders with inciting a riot. These nine included the owner of the Mangrove, Althea Jones-Lecointe, and Darcus Howe. The Mangrove Nine trial was Britain’s most influential black power trial. Jones-Lecointe and Howe represented themselves at the trial and demanded an all-black jury as a jury of their peers. The jury acquitted all nine defendants, and for the first time, a judge publicly acknowledged that there was “evidence of racial hatred” within the London police. Other BBP achievements included creation of a Youth League and the Freedom News newspaper, and organizing a march of 10,000 people protesting the Immigration Bill of 1971 that reduced black immigration. In 1973 the BBP split into two factions, and ended soon after. The BBP had many offshoots, including British Black Women’s Group, Squatter’s Rights Movement, and the Race Today magazine. The long-neglected BBP has been highlighted in 2017 in a photography exhibit at the Tate Museum, a proposed film on the Mangrove Nine, and airing of Guerrilla, a new drama series loosely based on the BBP. Anne-Marie Angelo, “‘Any Name That Has Power’: The Black Panthers of Israel, the United Kingdom, and the United States, 1948-1977,” Ph.D. Dissertation (2013), Department of History, Duke University; Robin Bunce, “Obi B. Egbuna, C. L. R. James and the Birth of Black Power in Britain: Black Radicalism in Britain 1967–72,” Twentieth Century British History, 22, (2011); Sarah Hughes, “The story of the British Black Panthers through race, politics, love and power,” The Guardian, (April 9, 2017), https://www.theguardian.com/world/2017/apr/09/british-black-panthers-drama-photography-exhibition.